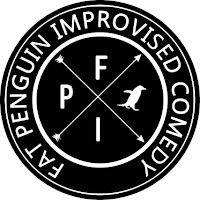 NUMBER 9: Theatre, Music and Film: REVIEW: Fat Penguin Improvised Comedy - Tribeca, Manchester. 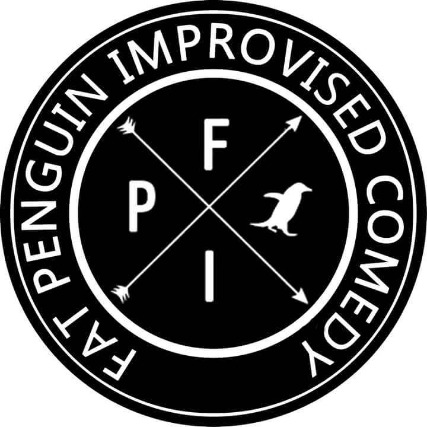 REVIEW: Fat Penguin Improvised Comedy - Tribeca, Manchester. As part of Manchester's 'Women In Comedy Festival' curated by The Frog And Bucket, Midlands impro comedy troupe 'Fat Penguin' came to Manchester today to delight a disappointingly small audience in Tribeca's basement performance venue. Sadly the venue didn't really help the performance as the stage was set at a rather odd angle with vastly insufficient lighting, meaning that faces and in some cases whole bodies performed unlit or poorly lit throughout. The venue and capacity was very small and so there was no need of a microphone at all; simply speaking articulately and projecting properly was really all that was required. However, again, sorry to report, but there were a couple amongst the troupe who needed to up their volume somewhat. For those unfamiliar with an improvisational comedy format, then this troupe's repertoire and routine would be an ideal starting point for you to understand how it, in its simplest form, works. Today's troupe consisted of 8 performers, - oddly 2 of which were male, in a Women In Comedy festival.. however glossing over that for now.... - and they started by asking the audience for two nouns. In this case they were given 'bus' and 'fruit'. These two words were then taken on board and they would take turns in small groups of two, three or sometimes more [the lead improviser choosing which people he / she wanted to work with] and when that single idea had run its course, another person would stand forward, tap one on the shoulder to return to the group whilst they then took the improvisation in another but related direction - using a trigger word or sentence from what has just been happening. After a while, this becomes a little stagnant, and so one person comes forward to 'tell a story / anecdote' which changes the subject completely. Once the subject is clear, the whole process starts again with the smaller impros sparking off each other. No more further audience involvement was called for in this scenario. To be honest, it was a format / formula that I learned in my first improvisation lesson at drama school; and so I can only assume that this troupe is either very new on the scene and learning by doing, or they have a very fast turnover of improvisers and this is the first stepping off and up ground for them. The whole hour was taken up with this rather boring and tired formula, and unsurprisingly really, the laughs were somewhat thin on the ground. [this wasn't helped by the lack of audience admittedly]. There were some clever ideas brought to the table - Pedants Anonymous, The Drink Association, and Watermelons Have Rights being among them - but using this format none of the ideas were ever allowed to develop, and I would have liked to have seen where some of these thoughts were going. Once again, I assume the impros were cut off very quickly because the troupe was inexperienced. This is not a negative criticism since we all have to start somewhere and we all need to learn the craft as we go along; it is merely an observation. For this type of comedy you have to have not just a razor sharp wit but be highly intelligent and knowledgeable too, as well as knowing the basics of stage acting! A pleasant hour's diversion, and I wish the troupe much luck and success in growing and developing.